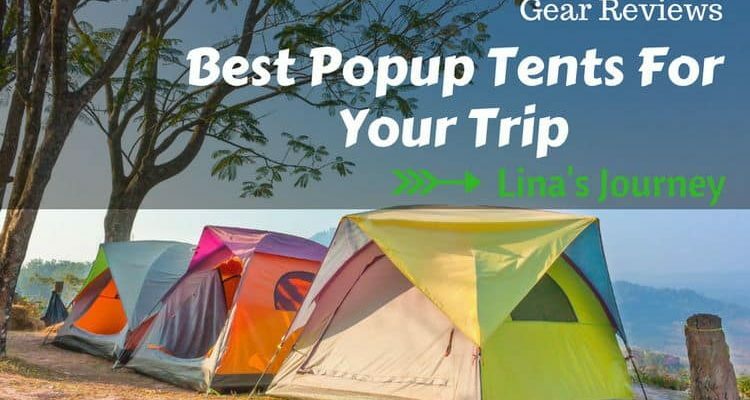 Blog » Camping » Tips & Tricks » Gear Reviews » The Best Pop Up Tent For Your Amazing Trip : How To Choose? How To Choose The Best Pop Up Tent For Your Camping Needs? Any experienced backpacker or camper knows that a proper, quality tent can make or break a camping trip. Whether you’re just out for the day or plan on taking a longer trip, your tent choice will determine what you’re able to get out of your camping experience. The following rundown will help you choose the best pop-up tent to suit your needs for any outing. Pop-ups are wonderful for shorter camping trips in optimal conditions, but there are many more styles of tent to choose from. To help inform you further, we also have a guide covering the key differences between 3-Season and 4-Seasons tents that will help you choose the best style for your camping needs. Click here to take a look! Additionally, Canadian Tire has an excellent video on YouTube that covers the basics of what you should keep in mind. What Type Of Pop-Up Tent Should You Choose? Let me show you top 4 best pop up tents for your trip with editor rating. My absolute favorite in our pop-up list, the Coleman Evanston Screened Tent is the complete package, wrapped up with a reasonable price tag. It comfortably fixes both yourself and five others. The 68-inch (5.7 feet) center height in the tent’s center makes it spacious and roomy throughout. It also measures 14x10 feet across the floor, not counting the additional, screened front porch. Adding to the Evanston’s versatility is the rainfly cover that totally waterproofs the tent throughout all seasons. Furthermore, the fly covers the relatively expansive front porch, which features a large double door. The mesh windows and roof allow for exceptional airflow, even with the rainfly attached. What really puts the Evanston above the other tents in our list is the fact that it has all that space and versatility, but still remains easy to use. While it takes a little more work than some of our other pop-ups, the base design is simple. The extras don’t take much troubleshooting and a beginner can easily get the hang of them with a little practice. The FiveJoy is another solid choice if the Evanston isn’t quite right for you. It features a built-in rainfly, with mesh windows that have flaps to keep you comfortable and dry. This particular pop-up is one of the easiest to set up on our list. It does include stakes, however, for attaching the window flap guy lines to the ground. The porch is smaller than that of the Evanston, but is built into the main body of the tent. This means when you pop your tent open, the porch is automatically ready to go. With less mesh than the Evanston, airflow is a little less efficient, but the convenient carrying case makes transport a breeze. Standing at 4 feet tall, the FiveJoy has less center height than our top contender, with around half of the Evanston’s floorspace. This makes is more suitable for smaller groups or even a solo camper looking for room to stretch out. Storage pockets and a center hanging loop allow for easy access to whatever you may need. Additionally, the FiveJoy Instant 4-Person Pop-Up Dome Tent is wonderfully durable, with a water resistant coat. This discount beauty is basically a smaller version of my favorite tent, the Evanston.If you don’t need the extra bells and whistles it’s right up your alley. There isn’t a porch attached to the Sundome, with the rainfly not covering as much area. The fly extends about halfway down the tent’s side, which is good enough to see you through moderate rain without any issues. The mesh roof is similarly missing from the Sundome, but mesh windows with nylon flaps allow for solid airflow. The floor measures almost 8x7 feet, giving you all the space you deserve. The center height is just over 5 feet, which is a touch more than the FiveJoy’s 4 feet. This tent is somewhat easier to set up than the Evanston, but still has a minor learning curve. It involves more work than the FiveJoy, but is still not difficult in any sense. 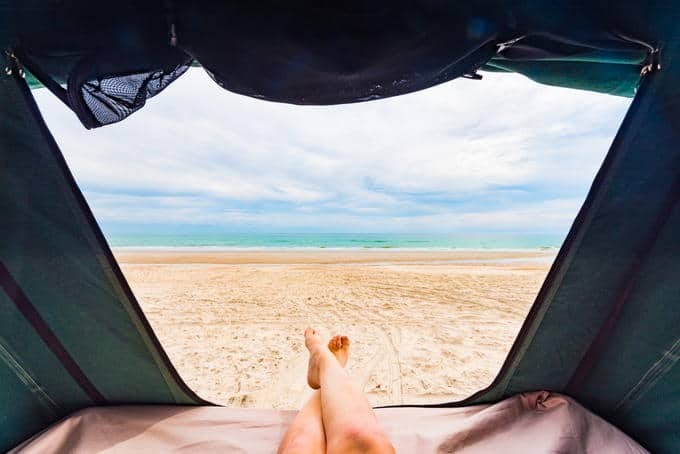 With an insanely low price tag and so much to offer, this is a perfect tent for light to moderate camping, as well as any day trip to the beach or park. If you want the very best, look no further than the awkwardly-named Coleman 2000018295. This 8-person tent, like most other Coleman pop-ups, does require some additional support to get it set up and ready for whatever nature can throw at it. The fully waterproof design also includes a solid, welded floor for further durability and support. Two doors allow for easy access no matter what’s going on inside, with 7 windows allowing for full airflow and ventilation. This breezy tent has window flaps, just in case the weather gets rough, and a built-in divider to separate the interior into two rooms. While not completely necessary, the two-roomed feature is incredibly useful. To help make things a little easier, the poles do come attached, with setup taking no more than a couple of minutes on most first attempts. A center height measuring 6.5 feet means even the tallest members of your group can enjoy being inside without feeling cramped. Furthermore, the 14x10 foot floor makes the Coleman 8-Person Instant spacious enough for any activity. It goes without saying that the best beach tent available has the word ‘beach’ in its name. That being said, it stands out in more ways than even its name would suggest. The open concept design makes it easy to empty the interior of sand after your trip is complete. It also makes the entire setup more lightweight, coming in at a sleek 6 pounds. Additional features include a wealth of pockets and storage spaces, as well as plenty of roof-mounted hooks. The tent material itself is breathable, water repellent, and offers 50+ UPF protection. All this combined makes for an excellent day at the beach with complete protection. The Screenhouse is exactly what it sounds like. A large canopy with mesh sides and support poles, it takes a little more work than most of our other pop-ups. That being said it still not difficult to get used to and only takes a minute or so. Airy and spacious, there is not much protection from precipitation in bad weather. That being said, it is a relaxing spot to enjoy your picnic without being overly concerned about sun protection. Two entrance doors make access easy and zippers protect both your guests and your food from insects and other pests. With the easiest assembly that any tent has to offer, this is perfectly suited for your children and their friends. It comes complete with a low price and is incredibly lightweight, with set up as easy as dropping it on the ground. The tent is designed to simply, well, pop-up in the easiest way possible. This tent is perfectly suited for beach or backyard use, comfortably holding 3-4 adults. It isn’t waterproof at all, but that’s a feature that you don’t really need in a tent like this. It also weighs 5 pounds and is kept in a convenient carry bag. This tent has it all. It features a solid frame that allows for easy assembly, with window flaps in case you need extra insulation. Tailored to wet environments, the Wenzel Alpine has a built-in mud mat, coupled with a drainage strip to keep your tent dry and looking like new. It weighs 8 pounds, with a center height of 4 feet. Additionally, the floor measures 8x8 feet. Comfortably holding 3 people, the Alpine is perfect for all skill levels. The rainfly, however, isn’t very large, leaving the stock Alpine more vulnerable should it rain while you’re out and about. Don’t let its size fool you. This tiny tent has everything you need to make the most of your camping trip. It doesn’t matter if it’s for the day or an overnight trip, the Kelty Grand Mesa is just what you need if you’re heading out solo or with another companion. Its solid design and durable waterproof rainfly allow for incredible comfort in any weather conditions. Adding to this is the fact that it is able to be moved easily while assembled. If conditions get rough and you need to move out of the open, for example, that’s no hassle at all. The Grand Mesa isn’t spacious and isn’t meant for more than a pair to sleep in, but its center height still sits at 3.5 feet. It’s also almost completely mesh, making airflow no problem at all. A small tent will always have some drawbacks, but the Grand Mesa’s weight of just over 4.8 pounds more than makes up for them. Another Coleman masterpiece, the aptly named Coleman Pop-Up Tent is one that really deserves the name. While it’s not all that roomy, with space for two campers, it does have limited storage space, which helps. Another key feature is the multi-position rainfly, which lets you customize how it hangs over the tent, just in case extra protection is needed in hard to reach spots. Coleman proudly declares that the tent can be set up in under 10 seconds, which is quite a feat with a tent featuring attached poles. Useful in all weather conditions, this 2-person tent is cheap and cheerful while still being rugged and suitable for all conditions. Even with these benefits, the 2.5 foot center height might be an issue for some. General-purpose tents should stand up to the elements, although measures like waterproofing are not required and are usually lacking. These are perfect for day trips as a way to keep cool and stay out of direct sunlight. Some might come with external rainfly for added protection from precipitation, but most aren’t meant for subpar conditions. 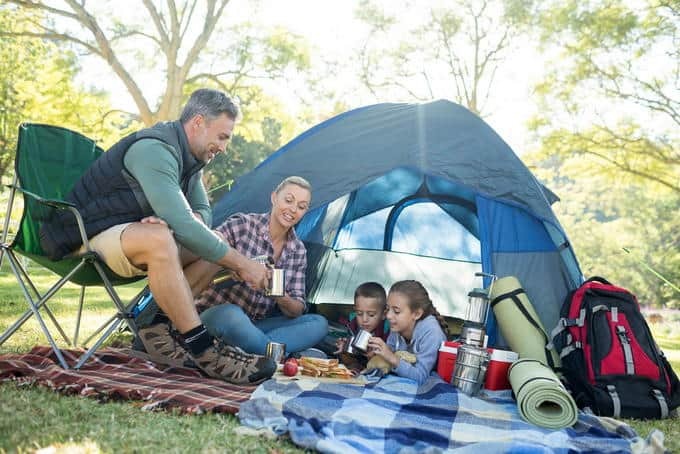 If you’re planning to spend a day at the park or a festival, these are perfect additions, but they do have some drawbacks when it comes to overnight camping. The general lack of heavy-duty protection means that it could end up cold at night, with heavy rain being a problem as well. These tents are good for families with young children or groups of daytrippers and can be used for everything from relaxation to storage. If you plan on swimming and/or changing clothes in a public area they will also provide privacy from prying eyes. Most casual or infrequent campers will be just fine with a general-purpose tent. These have the added benefit of being relatively simple in design, making them easy to set up and break down. They are specifically suited to be lightweight and uncomplicated for campers of all ages and capabilities. Most smaller pop-ups fall into this category, but some large ones do, too. These tents are a little more effective when it comes to rougher terrain or wet conditions. They will feature a rainfly that is either built-in or included as a cover, allowing you to keep the elements at bay with infinitely more ease than a general-purpose tent. They still feature a fair amount of mesh and ventilating features, but are less exposed and more insulated than their day-tripping counterparts. If your camping expedition involves more than just an afternoon out and about or if there’s any chance of rain, camping tents will be a huge benefit. They are a little more complicated to put together than general-purpose tents and can use a combination of supports, poles, and guy lines, depending on the tent’s style. Even so, camping pop-ups are much simpler to set up than most other tents. These are suited for more intermediate campers, but beginners can similarly make use of their added features and rugged design without too much ado. Their added insulation, better waterproofing, and more intricate setup do make camping pop-ups a little heavier than general-purpose pop-ups, which is certainly an important factor if you’re going to be mobile. Similarly, a rainfly and other extras, like stakes, can add a lot of bulk if you’re not careful. This added weight, however, isn’t too much of a burden with proper inventory management. When it comes to heading out en masse and enjoying a day out with family and friends, you will need a tent with a little more to offer. They should also be completely breathable, allowing for full airflow on those hot, summer days. Furthermore, a good beach/picnic tent will have a large enough interior to ensure multiple people can pack in without feeling crowded. Enjoying an afternoon can involve many moving parts, especially if you’re accompanied by a large group. Having a place for storage and food prep is important, as is having a central place where items to be used throughout the day are kept. A beach/picnic pop-up ensures that you’re covered on all fronts, allowing you to relax and enjoy yourself. Many beach/picnic tents feature tall, wide doorways, coupled with an abundance of mesh and ventilation. Instead of being a place for privacy and personal storage, they are used predominantly as a shady spot for you to hang out and regroup in between activities. Likewise, they also provide a covered area for group storage of items like food, toys, or games. A lot goes into choosing the right tent for your camping needs, but that doesn’t mean it has to be difficult. When you know what to look and are aware of any potential issues, you are better able to come to the correct decision. The previous pop-ups are excellent examples, but there are many more out there to choose from. Only you know exactly what you’re looking for, making the ultimate decision up to you. 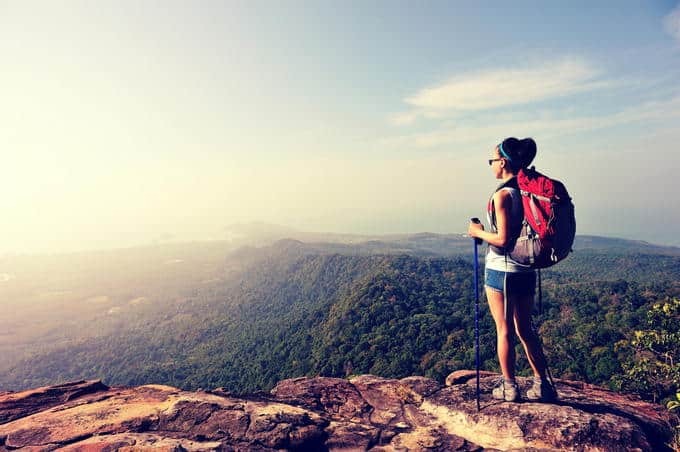 With this in mind, you should consider your preferred camping style, and those of any companions you might be bringing along, carefully before making your final choice. As mentioned, the Coleman Evanston Screened Tent is by far your best bet, no matter the situation. Its spacious interior makes it perfect for any group up to 6, while the rainfly and mesh roof allow some serious adaptability. It is completely waterproof, should you find yourself caught in bad weather, but the fact that it’s still extremely breathable keeps it from ever becoming stuffy. While the other pop-ups covered are useful in specific situations, the size and flexibility of the Coleman Evanston Screened Tent is hard to ignore. Also worth noting is that the Evanston’s reasonable price tag and ability to fit 2 entire queen sized beds in its interior, along with having a waterproof, covered porch area and mesh roof, make it even more impressive.